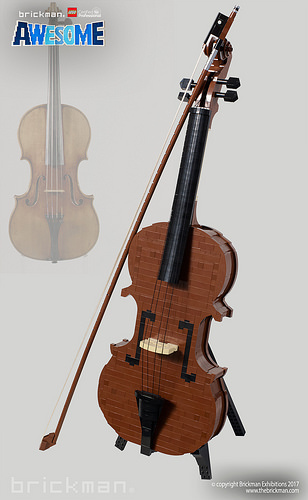 Ever wonder what a LEGO violin sounds like? Me neither. This realistic model by Ryan McNaught may not produce the high-quality sounds of a Stradivarius, but it almost looks like the real deal. The distinct shape of the instrument is made possible by curved slope pieces, and the use of the radar dishes for the scroll is incredibly realistic. Even the bow has a bend to it and retained its characteristic pearl eye on the frog. Let’s hear that concerto in brick major! The f-holes (no, seriously, that’s what they’re called…I looked it up) might look better if the black bricks were sunk into the surface instead of flush with it. As it is, they kinda look painted on. Veey cool! I’m still hipiho someone buibui a functioning piano.